For vignette correction, we are currently using the 2D vignette polynomial model. However, we have confusion related to the range of x and y in the formula. Is the range of x, [1:Width] or [0:Width-1]? Vignette coefficient matrix has slight differences based on the two different ranges of x & y used. Two tags Black Level and Black Current are available in exif for dark current compensation. Currently we are taking mean of Black Level vector (which is a 1x4 vector) and subtracting it from the complete image (pixel by pixel). The question is how to use the complete Black Level vector for better dark current compensation or how to use Black Current to achieve the same outcome. A solution with respect to any single tag should suffice. This is composite tag in exif i.e. it is computed as a function of ISO, exposure time and Aperture. This single number may have a correlation with pixel value and may be useful in radiometric calibration. An application note on this would be very helpful. In terms of 4 Light Value, it’s simply the calculation of the Exposure Value (EV) using the ISO, exposure time and the aperture. it’s simply the calculation of the Exposure Value (EV) using the ISO, exposure time and the aperture. Note that this composite tag is not something that Parrot uses and it is just for information purpose. We do not recommend using it as an estimate of the quantity of light seen by the system. Can Parrot please explain how they conduct radiometric calibration with the Sequoia? If it does not follow well established calibration techniques of any other sensor, what is the calibration model Parrot/Airinov has developed with this sensor? How can the light value not be a reliable value? @clement.fallet talking of Exposure Value could you explain what has been reported in this thread? Dredging up this old topic again, but it seems that point 2. regarding Dark current compensation was never answered conclusively. 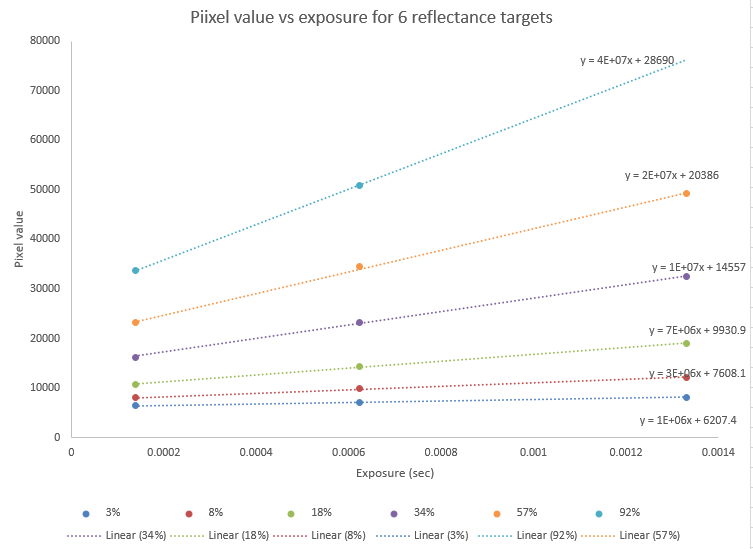 How is the black current value in the EXIF applied in the reflectance generation workflow, for example during processing in Pix4D? Is it subtracted from the DN?